Sheen Ibrahim was taught by her brother to fire an AK-47 at 15 and encouraged by her mother to fight for Syrian Kurdish autonomy, she says she has killed 50 people since she took up arms in Syria's six-year-old civil war, fighting first al Qaeda, then crossing into Iraq to help Kurds there against ISIS. Raqqa: Sheen Ibrahim's track record fighting ultra-hardline terrorists explains US President Donald Trump's policy of arming Syrian Kurds like her as he seeks to eradicate ISIS. It also highlights the risks. Taught by her brother to fire an AK-47 at 15 and encouraged by her mother to fight for Syrian Kurdish autonomy, she says she has killed 50 people since she took up arms in Syria's six-year-old civil war, fighting first al Qaeda, then crossing into Iraq to help Kurds there against ISIS. Now 26, she leads a 15-woman unit hunting down the hardline group in its global headquarters Raqqa, speeding through streets once controlled by the terrorists in a pick-up truck as fellow fighters comb through ruined buildings for booby traps. The US-backed Syrian Democratic Forces (SDF), spearheaded by the Syrian Kurdish YPG militia, have taken several parts of the northern Syrian town since their assault began this month. This week US Defence Secretary James Mattis said Washington may arm the SDF for future battles against ISIS while taking back weapons it no longer needs. The plan is the "headline" of a still-unfinished stabilisation plan for Syria by the Trump administration, said a US official, speaking on condition of anonymity. The risk is that it causes new instability in a war in which outside powers are playing ever larger roles. The US-YPG relationship has infuriated Syria's northern neighbour Turkey, a NATO ally which says the YPG is an extension of the Kurdish Workers Party, or PKK, designated terrorist by both Ankara and Washington for its insurgency against the Turkish state. Turkey has sent troops into Syria, partly to attack ISIS, but also to keep the YPG, which controls Kurdish-populated areas of northern Syria, from moving into an Arab and Turkmen area that would give it control of the whole frontier. On Wednesday Ankara said its artillery had destroyed YPG targets after local Turkish-backed forces came under attack. Turkey has recently sent reinforcements into Syria, according to the rebel groups it backs, prompting SDF concern it plans to attack Kurdish YPG forces. The SDF warned on Thursday of a "big possibility of open, fierce confrontation". "WE'LL DO WHAT WE CAN"
Syrian Kurdish leaders say they want autonomy in Syria, like that enjoyed by Kurds in Iraq, rather than independence or to interfere in neighbouring states. They say Turkish warnings that YPG weapons could end up in PKK hands are unjustified. "We were the victims of the nation state model and we have no desire to reproduce this model," said Khaled Eissa, European representative of the PYD, the YPG's political affiliate. Ibrahim and other fighters interviewed by Reuters said they were not terrorists but would "stand up" to Turkish President Tayyip Erdogan. "Turkey is fighting us," Ibrahim said. "Anyone who fights us, we will fight." Washington is working to calm tensions over its relationship with the YPG, which is also backed by Russia. "There is absolute transparency between Turkey and the United States on that subject," said Major General Rupert Jones, the British deputy commander of the US-led coalition fighting ISIS. But disarmament will not be easy, judging by the comments of YPG fighters on the ground. 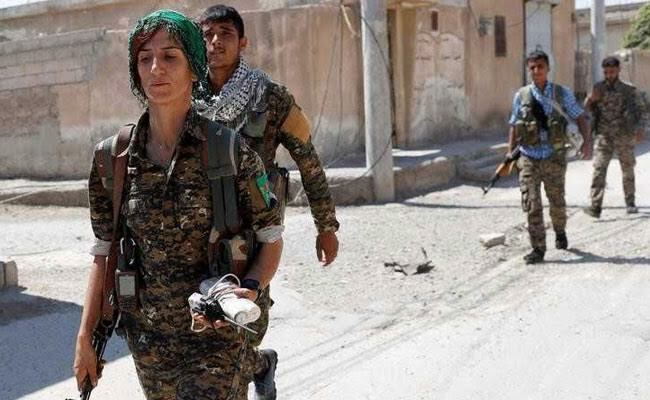 "We will not give up our weapons," said a sniper aiming at ISIS positions, who only gave her first name, Barkaneurin. "We need them to defend ourselves." Fellow fighter Maryam Mohamed agreed. "Erdogan is our biggest enemy, we cannot hand over our weapons," she said. One of the US officials said Washington did not know exactly how many weapons the YPG has because some Arabs had joined its ranks, taking US-supplied weapons with them, when their groups suffered setbacks on the battlefield. "Loyalties are as variable as the battle lines and sometimes follow them," the official said. Asked about weapons recovery, Mattis, in his first public remarks on the issue, said: "We'll do what we can," while YPG spokesman Nouri Mahmoud emphasised the target was ISIS. "We are fighting a global terrorist group," he said. Battlefield victory is tantalisingly close. US-backed forces in neighbouring Iraq announced on Thursday they had retaken Mosul, ISIS's largest stronghold and the twin capital, with Raqqa, of the "caliphate" it declared in 2014. But the US official and two others who also declined to be named, noted other huge obstacles to stabilising Syria they said the administration was papering over. Rebuilding Raqqa will need billions of dollars and an unprecedented level of compromise among groups long hostile to each other, all three officials said. One said Iranian forces backing Syrian President Bashar al-Assad were poised to exploit any setbacks. Kurds are spearheading the attack on Raqqa, but a mainly Arab force is planned to maintain security in the overwhelmingly Arab town thereafter. While Kurds and Arabs fight side by side against ISIS, with the terrorists' self-proclaimed caliphate shrinking, competition for territory will intensify. "We are getting ourselves into the middle of another potential mess we don't understand," one of the US officials said.